Started out great! Turned into absolute GARBAGE! I can't even believe it. If I spent $6 on this at Blockbuster I'd return it for a refund. Praise thepiratebay! This movie started out slow, but actually turned out to be a spectacular movie! It kept me on the edge of my seat and transported me to a time and place imagining the true horror these men endured to survive. Loved it. Horrible effects in this film. A lot of fake CGI, which is very noticeable. Don't waste your money would be my recommendation. 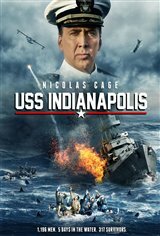 It does seem that Nicholas Cage movies are beyond terrible now.